The ancient Yin Yang symbol reminds us that life is a balancing act and most fulfilling when we learn to accept its dualities: the ups and downs, the good times and bad, joys and challenges. It was quite fitting then that I embroidered these ear bud cases whilst travelling outback Queensland roads – enduring the uncomfortable rides and enjoying the views. It was also a balancing act to embroider them to both appeal (hopefully) to my twin adult sons and suit their differences. 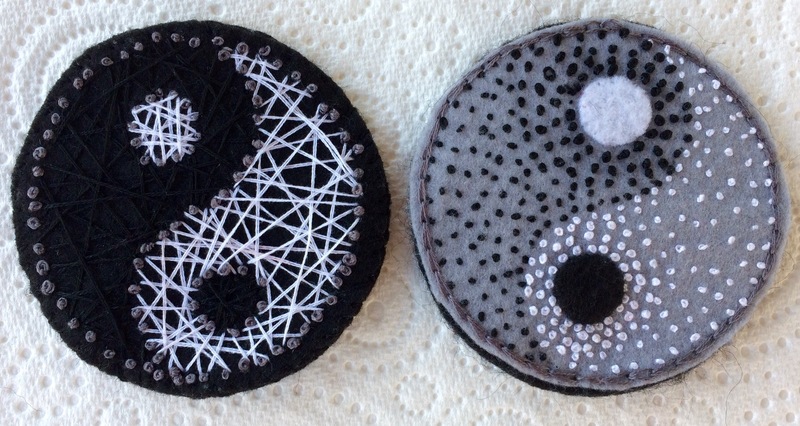 This entry was posted in All Posts, Embroidery, My 2017 and tagged Ear Bud Cases, Embroidery, Queensland, Yin Yang on July 1, 2017 by Helen.